Please do your work on a separate sheet of paper. 3. Max had 45 chocolate bars. He distribute an equal amount of chocolate bars into 9 cups. How many chocolate bars did he distribute into each cup? 7. Mia baked 126 cupcakes. She gave 6 cupcakes to each friend. How many friends went to her party? 8. Sam wants to share her 88 cookies equally with her eleven friends. How many cookies will each friend will get? Max has 24 chocolates. He wants to share an equal amount with some friends. Each friend got 4 chocolates each. How many friends does he have? There are eight mathematical practices that encourage all students to think like mathematicians in orders to solve a math problem which will also helped them to solve critical thinking problems in there every day live. The mathematical practices encourage students to think, use prior knowledge, and use multiple strategies. Also, the mathematical practices encourage the students to justify their solution with others as well as explain their conclusion on how they solve the problem and why they think they are correct. 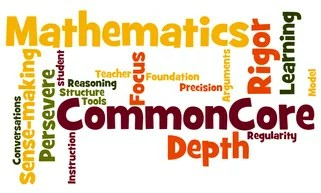 How Can I Implement the Mathematical Practices in the Classroom? Introduce the mathematical practices- Tell the students that through out the year they are going to be thinking like mathematicians and there are eight practices that will help them to solve math problems. Have a poster (Friendly language) for students to understand. During the lesson the teacher can refer to the MPs. (The teacher can only on one MP throughout the lesson or more than one depending on the teacher). Note to Teacher: Remember to take one step at a time and not to overwhelmed yourself or your students. Two weeks ago I attended a meeting and they were talking about how students in the 21 century want the answers now and they do not care about the process just the product. What is happening to our kids? I have some students that want the answers for their math problems now, they want the teacher to write the sentence now, they are not 100 percent involve in the process. This is not just my third grade class but I found out in the meeting that other teachers have the same exact problem. Their students also want the answers now. We need to involve the students in their own process of learning by having them evaluate their work. Teachers can use an evaluation sheet or rubric to evaluate the student’s work. A rubric will be great because the students can see their areas of strengths as well as their areas of needs. Then, the teacher can also involve the student on creating a goal that will help the student to strive for that specific goal that will help him or her to master a specific skill. The teacher can also make a visual graph so the student can see his or her progress. By giving the students fill out a self evaluation form or a rubric students, teacher, and parents would be aweare of the area of needs and strengths. Also, the educator will know if the student has master the skill or concept of that day. The teacher and student then come to an agreement to work on the are of needs. The teacher will write a plan a goal for that student to achieve. In addition, at the end of each lesson or learning center you can have your students fill out an exit sheet and a learning target log. I know that the process is not easy and trust me I know. Their are some success and some struggles throughout the process. I have come to a conclusion that I have to look at the positive all the things that happen and how I can improve them. In meetings, teacher lounge, and after school gatherings some of my co-workers comment about how their students will not complete work, read, follow directions, or listen to the teacher. I have come to a conclusion how can teachers ask for their students to do all these things if they themselves do not follow directions, listen to others, communicate, or complete work. The teachers want everything now but they are not doing anything to get it. We need to be the role models of our students.